With the move into the new month comes the parade of economic data for September. One of our long-standing favorites – the Purchasing Managers Index (PMI) – is leading the data parade off in an unfavorable fashion as it indicates manufacturing growth cooled a bit from its red-hot August pace. The overall PMI declined from 59.0 to 56.6 and the all-important, new orders component also fell from 66.7 to a still strong 60.0 (full table of the report is below). Is this decline the start of something bigger, as in a new trend of a seriously weakening economy? Is the Federal Reserve’s ending of “QE3” (3rd round of bond buying) scheduled this month and their talk of raising interest rates next year going to go down in the history books as a big fat mistake? Is a repeat at hand of 1937 when the second savage recession of the Great Depression era was triggered by Fed “tightening” (as high profile economist Robert Shiller fears)? In a world of uncertainty, many things can happen of course. But the probabilities of a recession dead ahead, let alone a savage repeat of the 1937 downturn, are very low. 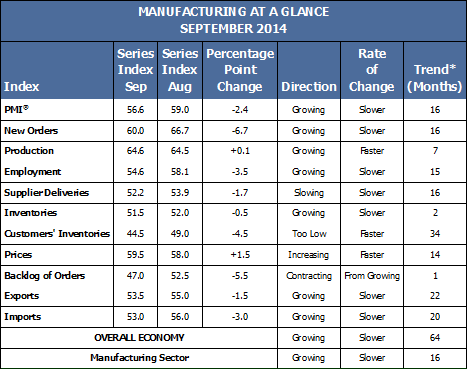 The manufacturing economy – even at the pace suggested by today’s data point – remains in solid growth mode. Likewise, the overall economy remains in expansion mode as well. Slow growth will remain the hallmark of this business expansion to be sure (courtesy of Washington D.C.’s wet blanket polices), but growth is not being powered by unsustainable excesses. To see our point, contrast the current expansion with the prior one. Growth in the 2002-08 period was augmented by the rapid accumulation of (housing related) debt. Meanwhile, house price appreciation led some consumers to outspend income growth via home equity loans. This time around, we have few such accumulating excesses (either debt or inflation). Heck, the savings rate is even rising this cycle! Some worry that student loans are the next excess to implode. Although such loans may restrain current consumer expenditures, they – unlike home loans – pose little systemic credit risk to the financial system. Absent excesses, the Fed will not jump on the monetary breaks as they did in the lead-up to the 1937 recession. A bit of history on that prior period may be helpful to revisit. Although he is now (unjustly) somewhat of a pariah among some “new age” economists of today, Milton Friedman characterized the Great Depression as the Great Contraction. He was not quibbling about semantics; Friedman’s seminal work reflects that the severe business downturns that bookended the 1930s were the result of the Fed enabling a massive outright contraction in the money supply to unfold. The modern day Fed’s ceasing of QE and a move away from its zero-interest rate policy are nowhere near the draconian actions and the monetary mistakes of the 1930s. While emotions that drive financial markets on a daily basis may temporarily flare up about weaker-than-expected data points, the U.S. business expansion still has miles to go before excesses make it brittle and subject to recession. Ditto for the uptrend in corporate earnings. Things rarely move in a straight line, so investor heartburn will almost certainly occur along the way. But as long as the uptrend in earnings remains in place, the bull market in stocks remains intact as well.